Have you ever fished sharks for sport? 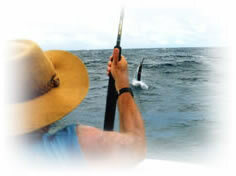 Fishing boats leave daily to take you out to sea where you can entertain yourself with sport fishing. Or do you prefer to be just comfortably taken across the sea on a boat excursion? Most boats sail from Puerto del Carmen, Playa Blanca or Puerto Calero, passing along the southern coast of our island. But there are also boat trips in the North of the island, leaving from Órzola to the islets of La Graciosa and Alegranza. Furthermore, you can sail on a catamaran or a genuine two-masted fore-and-aft schooner - a pirate ship that you will leave a real pirate! Or what about diving into Lanzarote's marine world without getting wet? Just get on the mini 'Yellow Submarine' and watch through glass panes the fauna and flora of the sea. Both experienced surfers and beginners can choose from a wide range of offers of equipment rentals, lessons, etc. The best surfing conditions are found on Lanzarote's northern and north-eastern coastal strips. For scuba divers, the sea around Lanzarote is paradise! It is famous for its diverse, fascinating marine life. Being of volcanic origin, the bizarre seabed houses a great variety of plant and animal life. The extensive flora and fauna can be perfectly watched in the marvellously clear water. Different centres offer diving courses of high quality, rent out the necessary diving equipment and inform you about the best areas for diving. Golf fans will be rather taken with Lanzarote. Thanks to the constantly warm climate, golf can be played here the whole year round. The 18-hole golf course of Costa Teguise was opened in 1978. A further one is being created in Playa Blanca; and there is a driving range in Puerto del Carmen. Furthermore, there are guided hiking tours, including the clambering through volcanic caves, climbing of mountains, or walking over the volcanic area along the coast of the national park 'Timanfaya'. There are numerous bike rentals for those who love biking. Most have special maps for their customers, containing specific details of the tours to make and the sights to see. Or enjoy floating through the air with a hang-glider. However, better follow the information by insiders on the suitable slopes! Take pleasure in the beauty of our Island's landscape while riding a horse! Excursions, lessons, and coach trips are offered in Puerto del Carmen and Uga. What about go-karting? 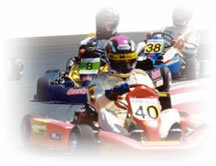 Two carting- tracks, one in San Bartolomé and an other one in Puerto del Carmen take will provide you with exciting fun. And those who would like to experience the normally inaccessible places of Lanzarote should join in a jeep safari and discover the secluded, deserted spots of our beautiful island. National parks: For old and young alike, the 'Guinate Tropical Park' in Máguez is a real experience. More than 1.300 birds and other exotic animals can be observed here. The 'Pardelas Park' in Órzola offers children and young people of all ages the contact with the local fauna and flora within a protected environment. 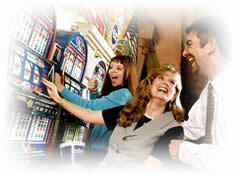 If you then have any energy left over, in the evening you can try to hit the jackpot in Puerto del Carmen's Casino in a pleasant atmosphere. And night life in the tourist resorts has got what it takes! In the numerous establishments, you can choose between live music of any style: from rock 'n' roll over soul music, jazz, rumba and flamenco up to Canarian folk music. For long nights, the many discos offer the latest sounds into the early morning. This list only gives suggestions and does not expect to be considered as a complete guide to Lanzarote's tourist attractions.